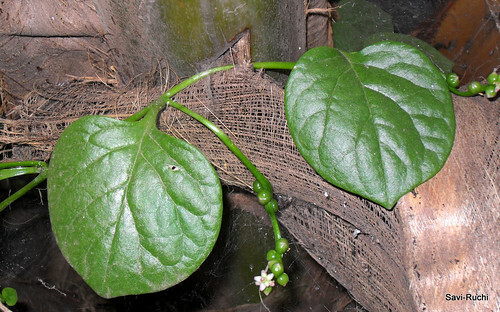 Do you need any hints?Here you go....,this is a creeper that is said to cure mouth ulcer & found in tropics.I have posted many recipes using this leaf. I owe the concept of this recipe to Purva. The day I saw her recipe, I was sure to try it out. I am preparing this from almost 10 months & each time I prepare this.., we all relish it thoroughly. This is a great option for weekend brunch. You can see her recipe here. Here is my version of the same. 1. Combine the vegetables, semolina, Italian herbs, red chilli powder, chaat masala, rock salt, salt & yogurt in a large bowl. Mix them well. (If needed, add few drops of water). 2. The mixture should look like a cutlet batter. See picture below. 3. Take a slice of bread & smear butter on both the sides. Spread the cheese on one side of the bread. To the same side, spread a tablespoon of vegetable-semolina mixture. 4. Heat the griddle. When griddle is hot, place the slice of bread. (Note: The vegetable-semolina mixture must be on top). Cover the griddle & cook on a low heat for a minute. Flip the bread & again cook for 30-45secs. 5. Repeat the procedure 3 & 4 for all the remaining slices of bread. 6. Serve it hot with a dip/sauce of your choice. This sandwich is very flexible. Throw in whatever spices you need or just make it plain without any spices. It tastes great however you prepare it. Red chilli powder could be replaced with finely chopped green chillies or even be skipped! I am planning to prepare it with grated paneer only next time. Will let you all know the result. Lastly, I have received awards from Suhaina of SingaporeKitchen. Phew.., I am again late in accepting & publishing the awards. Thanks a lot dear. It means a lot. I have mentioned more about me here. I will display the awards in side bar. Cook macaroni according to the package instructions. Drain the water & keep aside 1 cup of the boiled water. 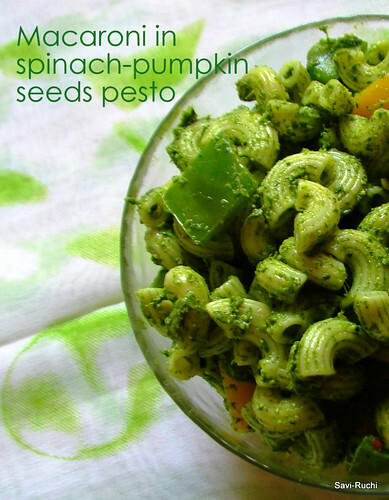 Blanch the spinach.Make a smooth paste of pumpkin seeds, blanched spinach, garlic, green chillies, Parmesan cheese, olive oil & salt. Finally add the lemon juice & keep it aside. Heat oil in a broad pan. 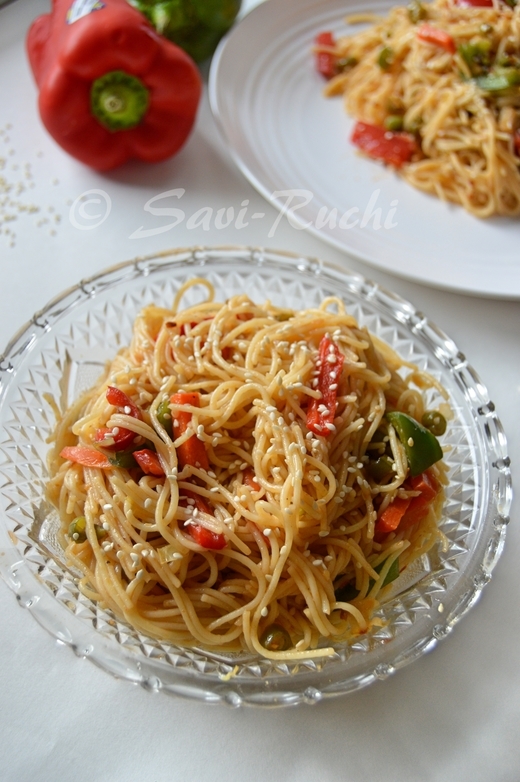 When oil is hot, throw in the capsicum & cook on a medium-high heat for 2-3 mins. 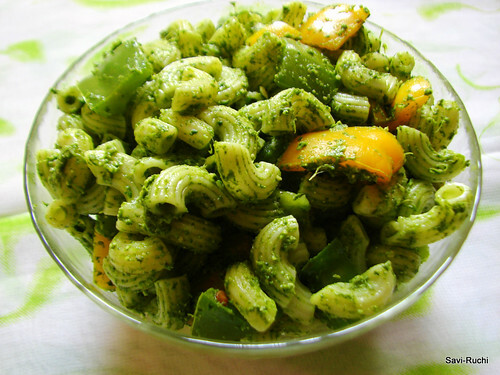 When the capsicum is cooked & yet firm, add the spinach sauce, cooked pasta & 1/2 cup of water. Mix them gently & cook on a low heat for 3-4mins. Adjust the salt (note: both the cooked pasta & the sauce has salt in it). Finally garnish it with cheese & serve hot. 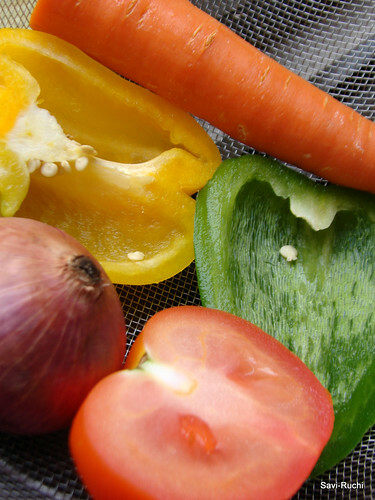 Refer this if you are blanching the spinach for the first time. Pumpkin seeds could be replaced with cashew nuts, almonds, walnuts or pine nuts. 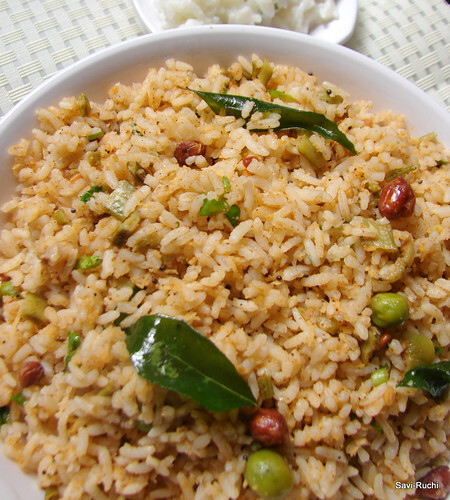 This is a traditional Karnataka dish which is a very similar to the famous 'Vangi bhath'. The spice powder mentioned here is also a close second to the vangi bhath powder. You can use the same powder for vangi bhath too. Gawaar: Hindi & Marathi. For other language translations, refer here. Step 1: Prepare the rice by adding double the amount of water & allow it to cool. Step 2: Meantime, heat oil on a broad pan. When oil is hot, add the finely chopped cluster beans & saute for a minute. Add few drops of oil & let it cook. When the beans are half cooked, add the peas & cook until both are soft yet crunchy. Step 3: Paralelly when the beans are getting cooked, prepare the spice powder. Dry roast all the ingredients mentioned for the spice powder & allow it to cool. When it is cool, prepare a powder out of it & scoop out the powder. Step 4: Boil the tamarind juice for a minute. This is done to remove the raw smell of the tamarind. The juice thickens. Keep it aside. Step 5: When the beans are cooked, add the spice powder (around a tbsp of the powder should be sufficient) & salt. Mix well & turn off the flame. Step 6: Prepare the tempering. Heat oil in a small pan. When oil is hot, add mustard seeds. When mustard seeds splutter, add peanuts. Roast till the peanuts are golden brown. Add the curry leaves, asafoetida, red chilli & cook for 3-5 secs. Turn off the flame. Step 7: Spread the rice in broad vessel (the rice must have reached the room temperature). Add the cooked spicier beans (cooked at step 5), tamarind paste (step 4), tempering (step 6) to the rice. Adjust the salt (note you have added salt to the beans already). Add the grated coconut, coriander leaves & mix the rice thoroughly. Serve it warm or at room temperature. Enjoy it with a raitha/papad or as is. Tamarind extract can be replaced with lemon juice too, however the authentic taste comes from the tamarind. 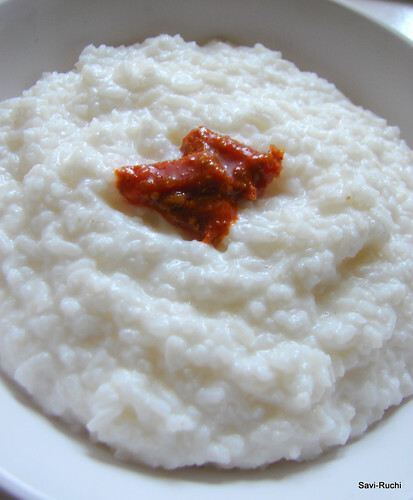 Replace fresh grated coconut with dry coconut/copra, if you wish to preserve this rice for a day or two. Excess spice powder can be preserved in air tight containers for later use. For quicker version, MTR vangi bhath powder can be used to prepare this dish. Per is a Tulu word for milk. The name of this dish is unlike its ingredients. Here milk refers to coconut milk. 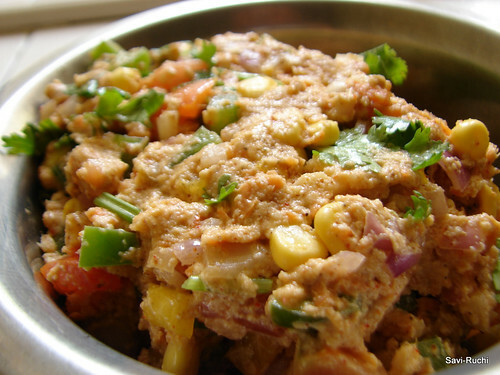 This is one special dish that can be consumed for breakfast, lunch or dinner. Very easy to prepare & tasty to eat. Coconut lovers can hook on to this dish for ever. I got this recipe from hubby's aunt during my last visit to India. I tried using store bought coconut milk, but somehow didnot like the taste of it. Freshly extracted coconut milk would taste & smell many times better than the store bought coconut milk. Soak the rice for 30mins. Meantime bring water to a boil. 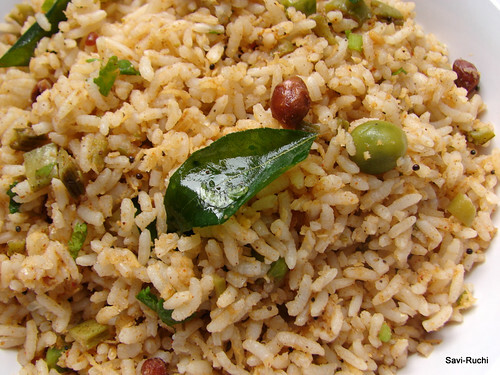 When water starts boiling, add the rice & cook it on a low heat until rice is 3/4th done. Add the thin coconut milk & cook again. When rice is completely done, it becomes mushy. At this point, add thick coconut milk & cook for another 3-5mins. Perganji/Coconut milk porridge is ready. 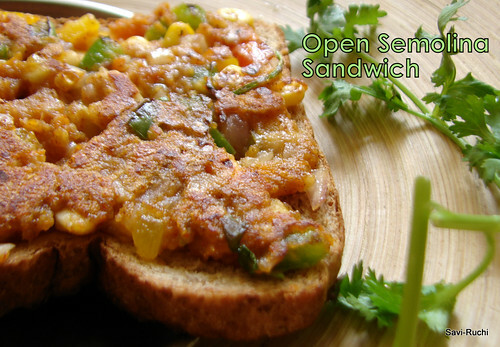 Serve it with pickle or chutney or palya/stirfry/poriyal. Donot add ghee while serving this porridge as coconut milk & ghee donot go hand-in-hand. 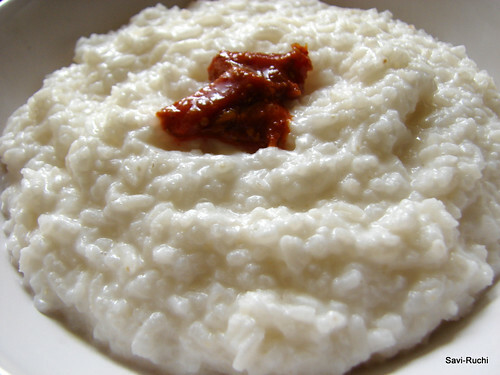 Salt is not generally added to this porridge, but if your family prefers, go ahead & add.